book launch | "Keep Running Mummy!" The other evening, I sat down for dinner with my children. 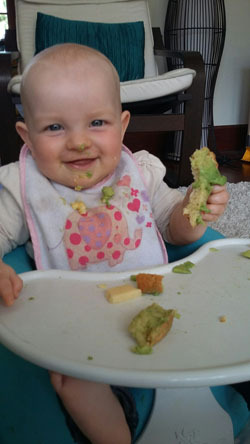 It looked like this: the two-year-old was eating a waffle and fish fingers. With lots of ketchup. The baby was being spoon fed straight from a jar of puree. We were sitting on the sofa in front of the telly. We weren’t even watching some sort of educational CBeebies offering… we were glued to Dragons: Riders Of Berk. I’ll be honest – this wasn’t quite how I’d pictured mealtimes, back in the days when I was enthusiastically whizzing up a homemade puree out of an organic butternut squash. A few years ago, I would have been mortified at the current scene (which admittedly is not every mealtime, but is regular enough that I couldn’t legitimately call it a ‘rare occurrence’). But you know what? Something has changed. This wasn’t even a conscious decision. It happened when my daughter was born. It happened because, frankly, running around after two children instead of just the one – and once more being on call during the night as well as the day – I simply don’t have time to worry any more. I don’t have time to worry whether the TV has been on for an hour more than it ‘should’ have been; whether all meals have been made from scratch; whether not taking my youngest to baby yoga/baby ballet/baby sign language/baby sensory classes is going to somehow stunt her development; and I certainly don’t have time to worry about how everyone else is raising their children – and how I compare. Ultimately, however parents get through the day, we are all doing the best we can for our children. And if that means a ‘from the freezer’ meal while glued to The Bedtime Hour to avoid meltdowns every so often most evenings, then that works for me. After all, tummies are getting filled and my children are happy. So now, rather than beating myself up about it, I’m happy, too. 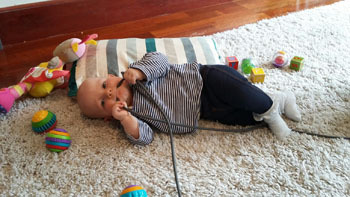 I had 10 minutes to clean the house the other day and, on leaving the front room to locate a broom, returned to find the baby had discarded her toys in favour of the vacuum cleaner’s electrical cord and was cheerily using it as a teething toy. Then yesterday, while cleaning the splash mat after my daughter’s enthusiastic baby-led lunch, the toddler swiped the Dettol (which I’d left lying on the floor) and casually gave his little sister’s head a spritz. In days gone by, both the above would have left me feeling like such a bad mother I’d have needed a 12-week course of therapy. These days? We simply rectify the situation and get on with things. Happily. No guilt. There’s been one other major change that has led to me feeling so much more relaxed and happy as a second-time-round parent: not only do I no longer have time to worry, but I have also not had a chance to open a single baby book. They have remained closed, on the shelf. Which has resulted in all those ‘shoulds’ remaining on the shelf as well. Gathering dust. Where they belong. Instead, I have been parenting by instinct. If it feels right to me, then it probably is. It’s liberating not to feel judged by a few hundred pages written by an author who does not know me, or my children. Not to be made to feel that I am somehow ‘spoiling’ my baby by cuddling her to sleep [check], bed-sharing [check] and baby wearing [check] (incidentally, I’m not saying any of this is the ‘right’ way to parent. It’s simply right for us). Ironically, this newfound ‘no-book’ attitude led me to an interaction on Twitter, which saw me recently attend a book launch. The Confident Mother by Sherry Bevan is a parenting book – but not as you know it. Comprising interviews with some truly inspiring mothers and experts, it doesn’t tell you how to parent: it simply helps you trust yourself. Its message is simple and brilliantly empowering – being good enough is good enough. Really. I am not the perfect mother. But I love my children with a love I never knew existed until they were here. And that’s good enough for me. Like what you’ve read? Follow me on Twitter or Like me on Facebook! 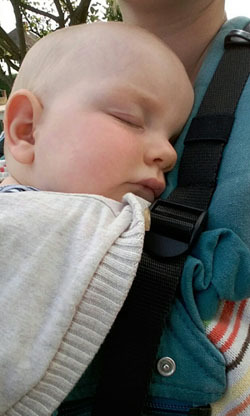 This entry was posted in Motherhood and tagged 'should', baby, baby wearing, bed sharing, book launch, guilt, Instinct, love, mealtimes, parent fails, parenting, parenting books, the confident mother, toddler on October 10, 2015 by Claire. Sometimes, doing a #plasticpatrol on the way to the beach pays off. We found this treasure left on the roadside and it made the BEST sandcastle topper!